Shellfish of any species ranks among my favorite foods, and oysters on the half-shell rank among my favorite shellfish. West Tisbury resident and cookbook author Susie Middleton will appear on "The Martha Stewart Show," and her live segment will air at 10 am and 2 pm this Wednesday, Nov.
A proposed public fishing pier to be built with state funds in Oak Bluffs reeled in the Martha's Vineyard Commission's (MVC) unanimous approval November 18. The Oak Bluffs School provided a much-needed dose of feel-good entertainment last weekend as a huge cast staged a sparkling version of the Broadway show "Annie." 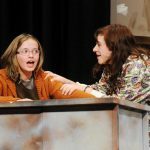 As theater goers walked into the entryway of the Martha's Vineyard Regional High School's Performing Arts Center last weekend, there was a prescient hint that they were about to be involved in something other than an ordinary theater experience. The Menemsha CafÃ© is serving dinner on Friday nights this winter, as well as this Saturday, Nov. 27, and brunch this Sunday. Be thankful for all your friends. This will be the first Thanksgiving I will not sit crammed between a cousin, nephew, or brother whose elbows dig into my ribs each time they take a bite. Jake Palches found his calling in life a few summers ago here on Martha's Vineyard when a family friend recruited the 24-year-old Oak Bluffs native, now studying at the University of Massachusetts Amherst, to work at Camp Jabberwocky. It's Thanksgiving morning in 1951. Last week, West Tisbury selectmen named Sgt. Weeks before the November 18 arrival of the Vineyard's waterfowl hunting season, I was checking out my shotguns and decoys, refurbishing duck blinds and testing cold weather waders and hip boots for leaks. "LZ-'75: The Lost Chronicles of Led Zeppelin's 1975 American Tour" by Stephen Davis, photos by Peter Simon. It seems a perfect pairing: Seaworthy Gallery, with owner/photographer Jeffrey Serusa's atmospheric images of marine subjects, and Sail Martha's Vineyard, with its programs and events in sailing and seamanship. Traditionally the Friday following Thanksgiving kicks off the beginning of the holiday shopping chaos. The Vineyard Playhouse's series Shakespeare for the Masses opens its third season Friday night with their tongue-in-cheek version of "Pericles, Prince of Tyre." Often on the Vineyard the things some might at first consider a constraint, become an advantage: Our town libraries regularly function as community centers; our places of worship become venues for lectures, forums, and films; and our art galleries serve in much the same way as museums — stimulating imagination, encouraging new original work, and making the fine arts part of the community experience. The Edgartown library design committee has ruled out the old Edgartown school as a site for a new town library. A group from Martha's Vineyard who are interested in wind energy recently took part in a conference on the topic in Maine. For nearly two years, between 2006 and 2008, members of the Dukes County charter study commission probed and debated the state charter that enables county government as we know it.